A former shepherd and self-taught sculptor has created his own Yorkshire Sculpture Garden, near Penistone. Jim Milner, aged 62, who lives in Thurlstone, has installed more than 20 pieces of his large works in the landscaped garden of his 19th century cottage. Jim, who has had a lifelong fascination with geometry, started carving stone when he was just 16 after discovering a mallet and chisel in his father’s shed. He worked as a farm labourer and a shepherd for many years, and then took over a small farm in Thurlstone, rearing sheep, cattle and pigs, before taking a maths degree and eventually becoming a full time sculptor. Born just outside Paris, Jim moved with his family to Cologne when he was five. His parents eventually retired to Thurlstone and taught him about art and literature. “Most of my art education was gained around the dinner table. My father took me to galleries in London, Germany and France and my mother had a degree in English and studied Anglo Saxon, so I was learning from them all the time,” said Jim. He went on to be influenced by sculptors Barbara Hepworth, Henry Moore and Peter Randall-Page, and artists like William Blake, Georges Braque, Ben Nicholson and John Piper. Jim produces work which now sells both in the UK and abroad. “I carved a lot of my early work in the farmyard, whilst shepherding. I even had sculptures positioned all over my fields for a while – they looked appropriate set in a rural landscape,” he said. Following the drop in lamb prices in 1999, Jim decided to quit farming and study maths, taking a degree at Sheffield Hallam University. 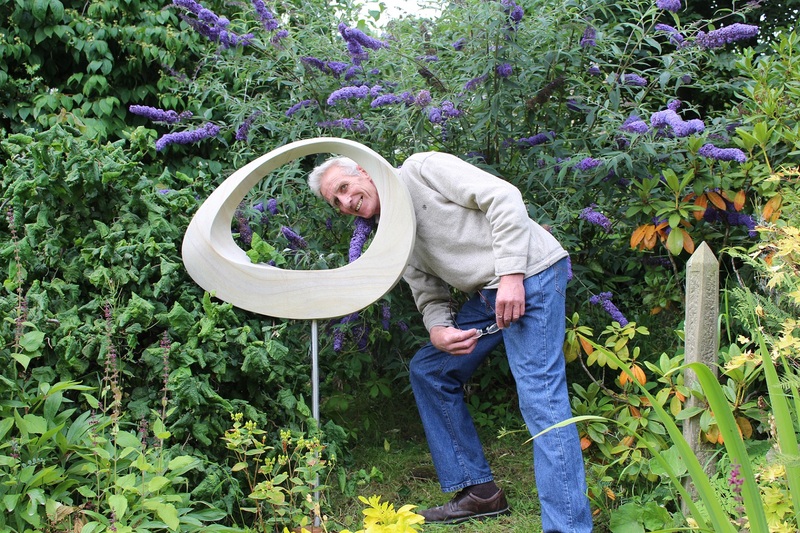 He continued to create his sculptures and now bases much of his work on the paradox of the Mobius strip, a seemingly impossible, never-ending loop of paper which has only one surface. 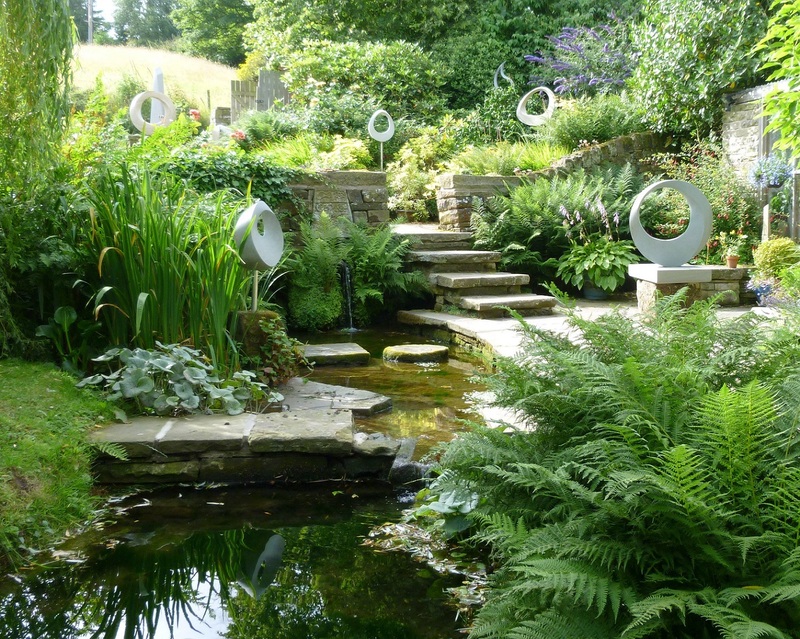 Since taking over his father’s house, ten years ago, he has remodelled the garden so that it has become a backdrop for his carvings, blending his sculptural pieces into a landscape which includes natural springs, waterfalls and ponds. Jim’s commissioned work includes a war memorial for Thurlstone and a boundary stone for the village. He also created a sculpture for a new garden at Cotswold Care Hospice in Gloucestershire, which was visited by HRH Prince Charles in December 2013. His interest in mathematics has led him to produce a series of engravings celebrating some of his own geometric ideas and also the history of mathematics.